PlaySpan has been on a tear recently, striking partnerships with a number of gaming and media companies, including Ubisoft, Sanrio and others. And today, the company is getting another vote of confidence—from Facebook. The social network will now offer PlaySpan’s UltimatePay payments product as a payments option for users who buy Facebook Credits, the network’s virtual currency that is used in more than 200 games and applications from over 75 developers. In conjunction with the announcement, Facebook is opening up credits to more developers today. With the Facebook integration, UltimatePay will add more than 20 new ways for people to purchase Facebook Credits, with new services being rolled out over the next few months. 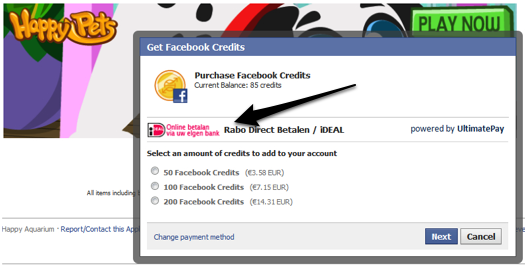 While Users can already pay for Credits via PayPal, Facebook’s pre-paid cards, and through most credit cards; Facebook users will now be able to purchase Credits using UltimatePay options, including store-bought prepaid cards such as PaySafeCard, Wallie-card in Europe, MyCard and Gash cards in Taiwan, and payment services that are popular in specific countries, such as bank transfers in Germany, Brazil’s Boleto Bancario and Russia’s Webmoney. If you’re a developer using Facebook Credits, you won’t have to do anything to offer these new payment options. UltimatePay will simply appear to people based on the country or region where they are located. This is no doubt a big win for PlaySpan’s payment option. Facebook clearly sees Credits as a viable revenue stream and some expect it to make up one-third of the network’s revenue stream in the next year. That means there could be considerable amount of money flowing through Ultimate Pay in the future. And for Facebook, UltimatePay could open up new payments options for members, especially for those living outside of the U.S.